I believe that the bulwark of Protestantism against Popery isfamily worship. Happy is the household where the altar burns day and night with the sweet perfume of family worship! that. The child’s remark was a great help. I agree with Matthew Henry when he says, “They that pray in the family do well; they that pray and read the Scriptures do better; but they that pray, and read, and sing do best of all.” There is a completeness in that kind of family worship which is much to be desired. Every house should be the house of God, and there should be a church in every house; and when this is the case, it will be the greatest barrier against priestcraft, and the idolatry of holy places. Family prayer and the pulpit are the bulwarks of Protestantism. That family of Mr. Matthew Henry, to which I have referred, was so well ordered that, very often, visitors to the house, who were unconverted when they went there, were converted during their visit. If there be such a Church in our house, let us order it well, and let all act as in the sight of God. Let us move in the common affairs of life with studied holiness, diligence, kindness, and integrity. More is expected of a Church than of an ordinary household; family worship must, in such a case, be more devout and hearty; internal love must be more warm and unbroken, and external conduct must be more sanctified and Christlike. Oh how holy and how heavenly ought your families to be when God has so favored you above many of his own people. Be very grateful, and while you are joyous, lay the crown of your joy at your Savior’s feet; and if you have now a church in your house, maintain the ordinance of family worship with the greater zeal and holiness, and pray for others that the Lord in like manner may visit them also. Great quotes. 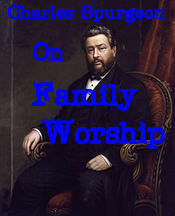 I'm writing a paper on the topic of Family Worship. What books of Spurgeon were his quotes from? am thinking of a family and the church. How may I get free booklets and notes on the same?